InSinkErator® food waste disposers are known for their rugged construction and reliability. That’s why they have been the #1 choice of professionals since InSinkErator® invented the category about 80 years ago. 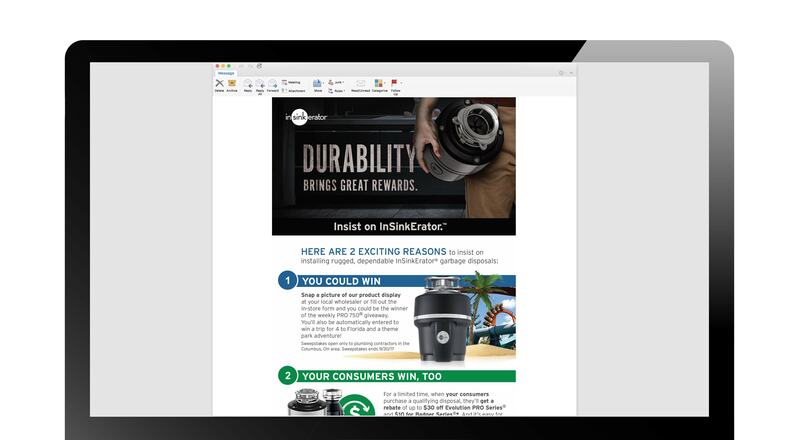 InSinkErator® enlisted C-22 to develop a promotional campaign designed to reinforce the quality message to professional plumbing contractors and to help keep their products top-of-mind. The result: a display advertising campaign built on the headline “Dependability You Can Lean On.” The ad concept appeals to a pro’s desire to protect their reputation, which is represented by products they choose to install. Because of that, they are encouraged to choose the InSinkErator® brand, which has proven to be dependable year after year and is a product they can count on to work as hard as they do.